International research efforts have advanced the understanding of the interaction among water resources, food security and energy production and consumption in the Mekong River Basin. However, increasing climate extremes and large-scale human developments such as urbanization, dams construction and agricultural intensification continue to pose threats to sustainable development in the region. An international meeting hosted by the National University of Laos, Vientiane, in August 2018, contributed to develop knowledge and explore solutions for better managing water resources in the basin. Over 80 researchers and experts from a variety of agencies and institutions in Southeast Asia and in the United States shared ideas, methods, technologies and knowledge to address the emerging water-energy-food nexus issues in the region. The meeting was supported by Universities and Research Institutes from Laos, Thailand, China and the United States, as well as regional and international institutions including the Mekong River Commission, Future Earth Asia and START. 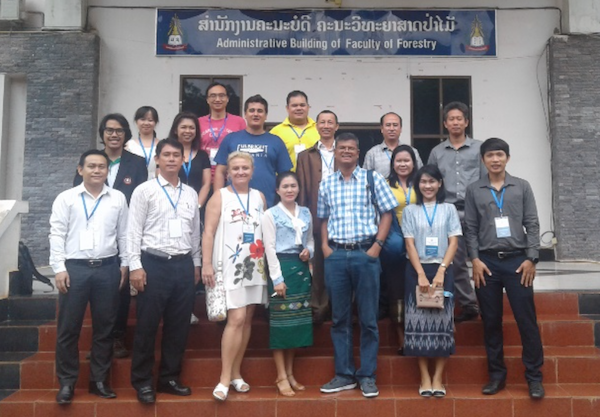 Following the meeting, START, as part of the Global Observation of Forest Cover and Land Dynamics (GOFC-GOLD) program, sponsored a three-day advanced training program for 25 participants from the region. The training program focused on topics including the potential of Synthetic Aperture Radar (SAR) remote sensing useful for agriculture applications, UAV applications for cadastral mapping and Hyperspectral remote sensing data and applications. The sessions were delivered by Professors from the NASA Marshall Space Flight Center, United States; Ho Chi Minh University, Vietnam; University of Chez Republic; Universitat Transilvania Brasov, Romania and Virginia Tech, United States. Attendees underlined the potential of remote sensing and GIS in addressing natural resource challenges, and stressed the need for making open source technologies and training available to researchers in the region.